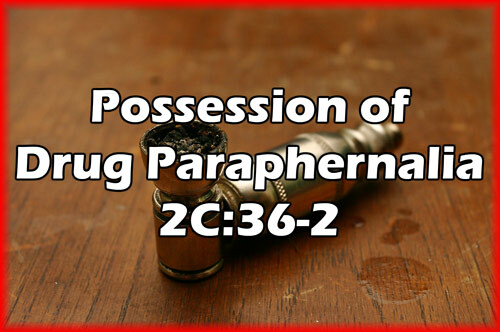 Possession of drug paraphernalia is often thought to be a minor drug charge because it usually stems from a harmless incident. However, do not make the mistake of thinking that a drug paraphernalia charge is insignificant. Not only are drug paraphernalia charges often attached to more serious charges of marijuana possession or cocaine possession; if you are convicted of drug paraphernalia possession, you could end up behind bars. Worse yet, you will have a drug conviction on your permanent record, which could have adverse consequences for you future employment opportunities. In addition, you may lose your driving privileges in New Jersey for six months to two years. That’s why it is crucial that you take your drug paraphernalia charges seriously and speak with a knowledgeable criminal defense attorney immediately. The attorneys at the Tormey Law Firm appear on a daily basis in courtrooms throughout Essex County, including Fairfield, Belleville, and Maplewood. Our drug crime defense team includes a former county prosecutor who successfully prosecuted a drug smuggling case. This is the kind of experience that has proved invaluable when defending clients in NJ drug cases because we know how a prosecutor builds their case. Call the Tormey Law Firm today at 201-654-3464 so that one of our experienced attorneys can look over your file and help you achieve the best result. You can also check out our Successful Drug Crime Verdicts & Settlements page. New Jersey law prohibits the use of drug paraphernalia for illegal purposes, as well as possession of drug paraphernalia with intent to use it for illegal purposes. As set forth by N.J.S.A. 2C:36-2, these illegal purposes include: planting, cultivating, growing, harvesting, manufacturing, converting, producing, processing, preparing, testing, analyzing, packing, repacking, storing, containing, concealing, ingesting, or inhaling any controlled dangerous substance (CDS). NJ prosecutors tend to interpret the law very broadly, so that practically anything can be considered “drug paraphernalia.” Examples of items that have led to prosecutions include: bongs, pipes, baggies, rolling papers, syringes, capsules, and cutting agents. New Jersey also criminalizes the delivery of drug paraphernalia to a person under the age of 18. This means that if you buy a cigar or a glass pipe for a minor, you could be charged with a third degree felony and face a sentence of three to five years in state prison. Additionally, you will be subject to an enhanced fine. The aggressive criminal defense lawyers at the Tormey Law Firm are ready to fight for you. We will do everything possible to win your drug paraphernalia case and keep your permanent record clear of a drug conviction. Call us today at 201-556-1574, or email us to schedule a free consultation at our office in Newark.